Make the most of your visit to DC on this comprehensive 5 to 5.5 hour private walking tour that will match you up with one of young local guides. Explore the monuments of DC on the National Mall, followed by a visit to the National Gallery of Art to see some of the nation's greatest art. Not only will you take in sites emblematic of America's capital and the pieces that have made it a cultural hub, you'll learn about the design and meaning behind them. Meet for this 5-hour tour at Lafayette Park a little before 10 a.m. Begin outdoors by discovering Washington DC’s vast collection of outdoor monuments. This tour is one of the best ways to visit DC’s iconic sites, including the White House. 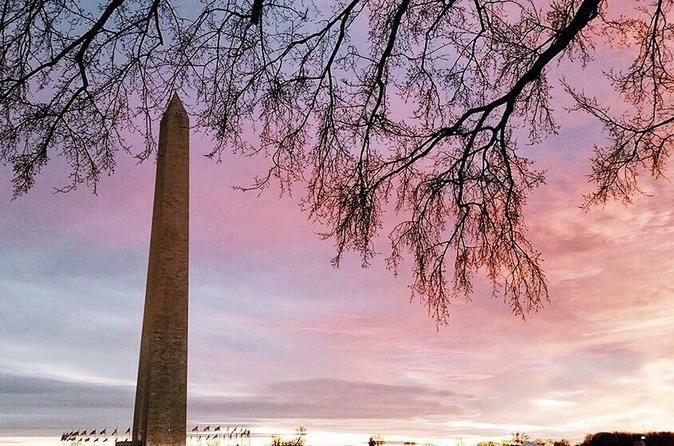 We’ll explore the history of the nation’s capital, as well as the monuments and memorials of the National Mall that feature figures like George Washington and Abraham Lincoln. Your engaging private guide will share the stories about the major players and events in American history that have earned memorials on the Mall, including the Korean War, World War II, and Vietnam. They’ll even divulge the intricate symbolism woven into these structures. You’ll be treated to many photo opportunities along the way, so keep your camera handy. After a break for lunch, move to the National Gallery of Art, and follow your guide through one of America’s best collections of artwork produced by Renaissance artists, French Impressionists, and great American painters. See works from Claude Monet, Raphael, Gilbert Stuart, Vincent Van Gogh, and Edgar Degas, as well as more modern artists like Picasso, Pollock, Warhol, and O’Keefe, as you learn what’s really behind the creation of some of these pieces. Your private guide leads the way through the halls of the museum, telling stories, and stopping at famous works of art. Some pieces you’ll see on this tour include Ginevra de’ Benci by Leonardo da Vinci, Self Portrait by Vincent Van Gogh, and Woman with a Parasol by Claude Monet. Listen as your guide fills you in on the techniques behind some of the paintings, as well as some of the history and scandals that happened because of them.